A little over a year ago, my husband, our 2-year old daughter and I boarded a plane to Spain — the first one of 18 planes in 12 months — to embark on a big adventure. Project title: paternity leave abroad. After a short stop in Madrid, our second plane brought us directly to La Palma, La Isla Bonita, the first of 18 locations in 12 months. Our luggage decided to arrive two days later. So much for a perfect start. But apart from that small incident, things went rather well. Our careful planning, which lasted months, has been worth every single minute and allowed us to relax, discover, and … work. While my husband got to test dozens of new playgrounds in his temporary role as a full-time dad, I was spoiled with workspaces close to nature. Nothing boosts my creativity more than a panoramic view. Here are my workspaces of the past year, including my all time favorite: Parua Bay, Northland, New Zealand. Gotta 💜 being a digital nomad. Would I do it again? Anytime! November/December 2017: Puertito de Güimar, Tenerife, Canary Islands, Spain. January 2018: Teror, Gran Canaria, Canary Islands, Spain. January 2018: Hong Kong. Digital nomad setup. February 2018: Riana, Tasmania, Australia. February 2018: Riana, Tasmania, Australia. With co-workers on the inside and the outside. February 2018: Hobart, Tasmania, Australia. March 2018: Parua Bay, Northland, New Zealand. April 2018: Auckland, New Zealand. 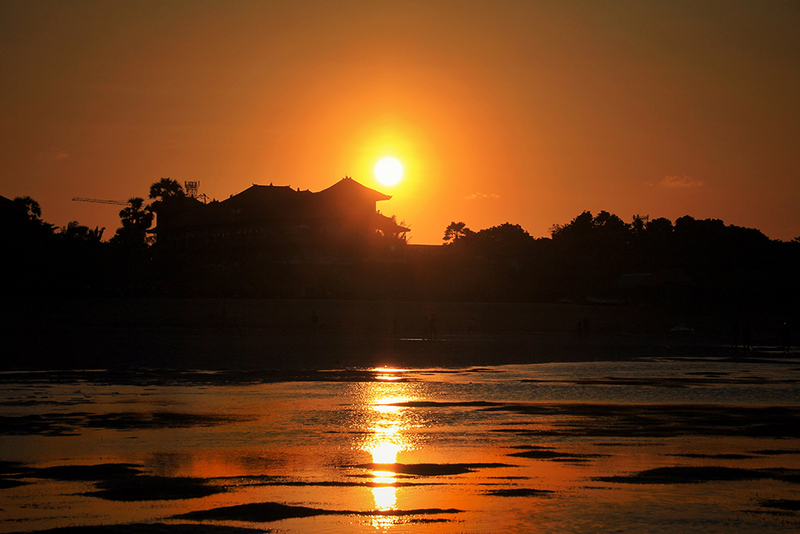 April 2018: Benoa Beach, Bali, Indonesia. May/June and August 2018: Nogent sur Oise, France. Since September 2018: Nantes, France. With a view over the Loire River… to be continued! 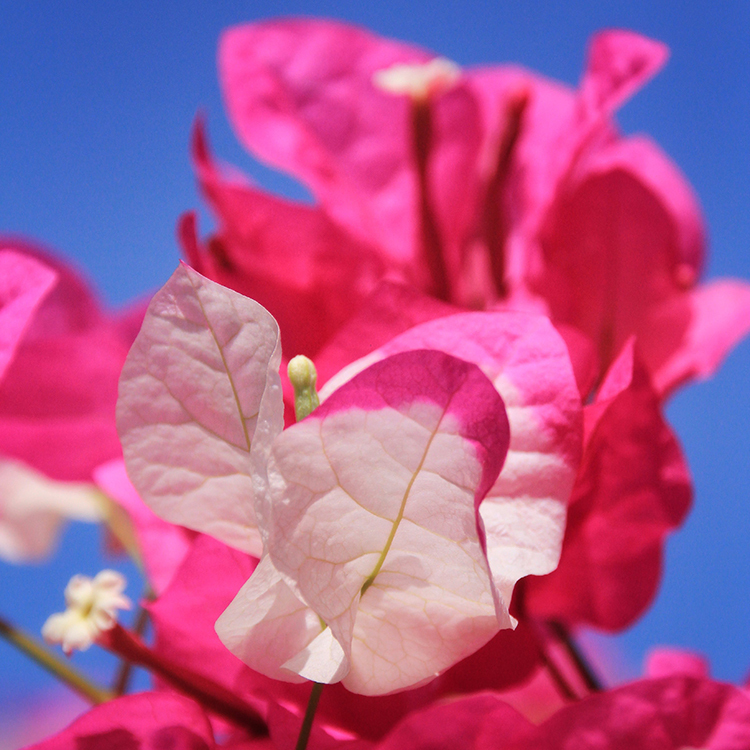 Which fabulous digital nomad workspace can you recommend? 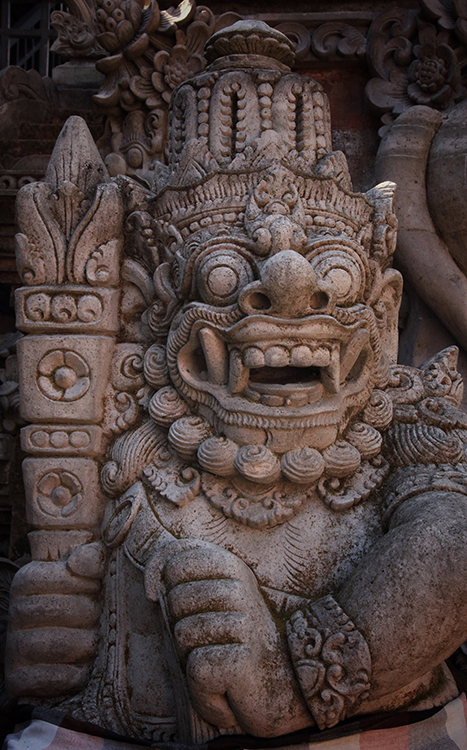 Bali with a 2.5-year-old? Yes, anytime again! 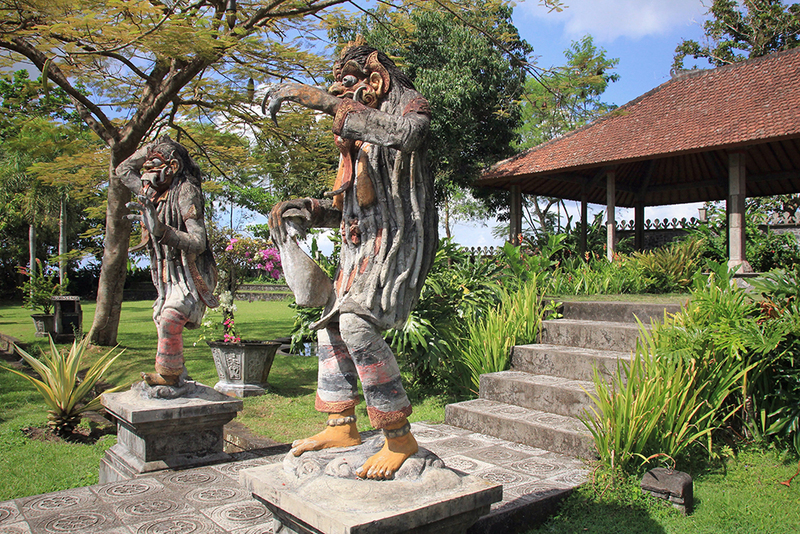 While our 2-week vacation in Bali earlier this year wasn’t flawless, we had a fantastic time there. The little one especially liked nasi goreng (fried rice), mi goreng (fried noodles), dancing and pool time, while my husband and I enjoyed all the temples, traditions and green landscapes. 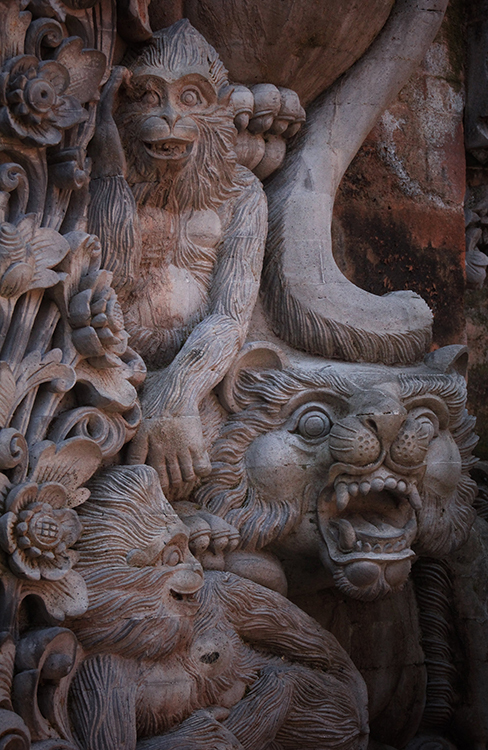 Bali really had something for each of us. I can’t deny though that we suffered from the heat. While adults can more or less deal with 30°C and higher, young kids struggle. Our daughter is usually a good walker, but in Bali 200 metres were waaaayyy too long for her. So we had to do a lot of carrying, which isn’t enjoyable under such conditions. You might wonder why we carried her instead of using a stroller; the road and pavement conditions make it impossible to go for a walk with a baby buggy (especially in Ubud). So we did a few trips with our Deuter Kid Comfort (which is a life-saver) and spent a lot of time in taxis to visit different places in the cultural Centre, relaxed East and buzzy South of the island. Word of advice: if your kid is too small to properly sit in a regular car seat with a regular seat belt, you should pre-book your taxis with a service like Bali Bubs, who do not only offer airport transfers with baby conform vehicles but also rent out baby equipment if you plan to travel light. We were lucky in a way, as our girl is way too tall for her age and was comfortable and safe in the middle seat of the taxi back bench. Time wise, two weeks were perfect without being in a constant rush. 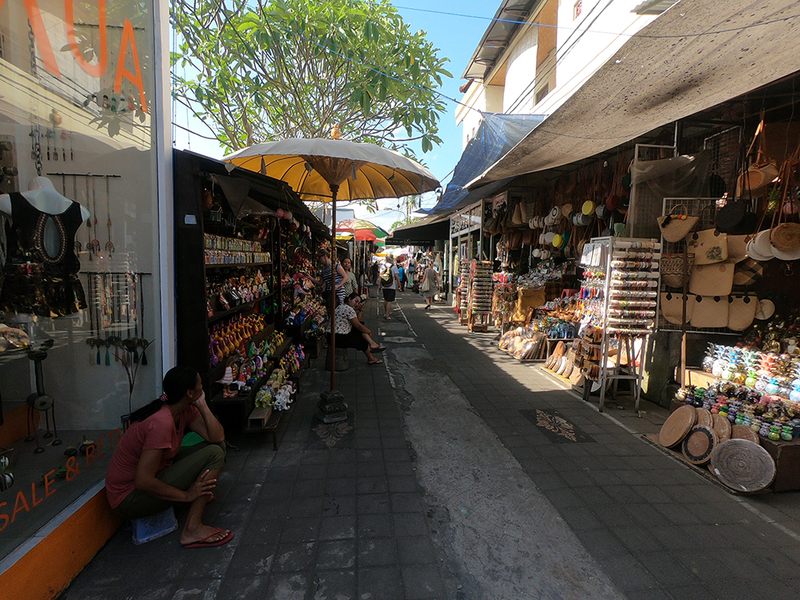 Quiet days are essential when travelling with kids and so we spent 7 days in Ubud, 4 days in Amed and 5 days in Benoa Beach. 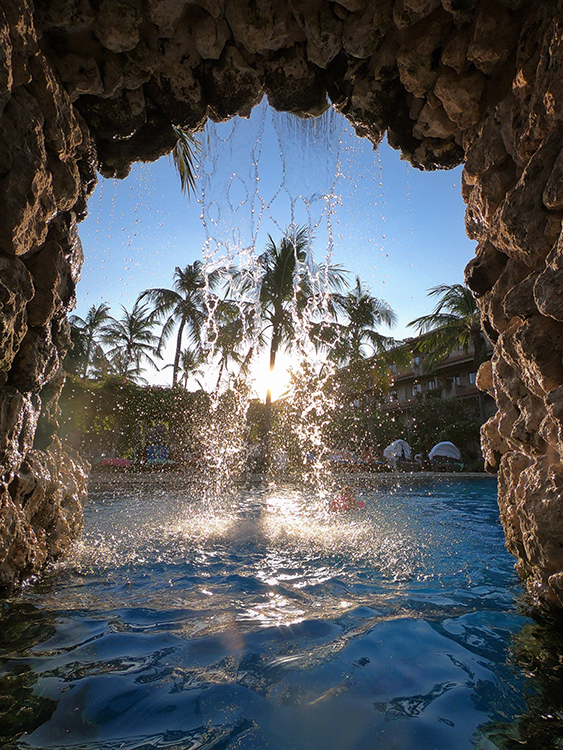 But even the lazy days at the hotels were an adventure (pools, restaurants, kids club, …), so I would have been glad to stay for a third week. The gallery below is chronological. 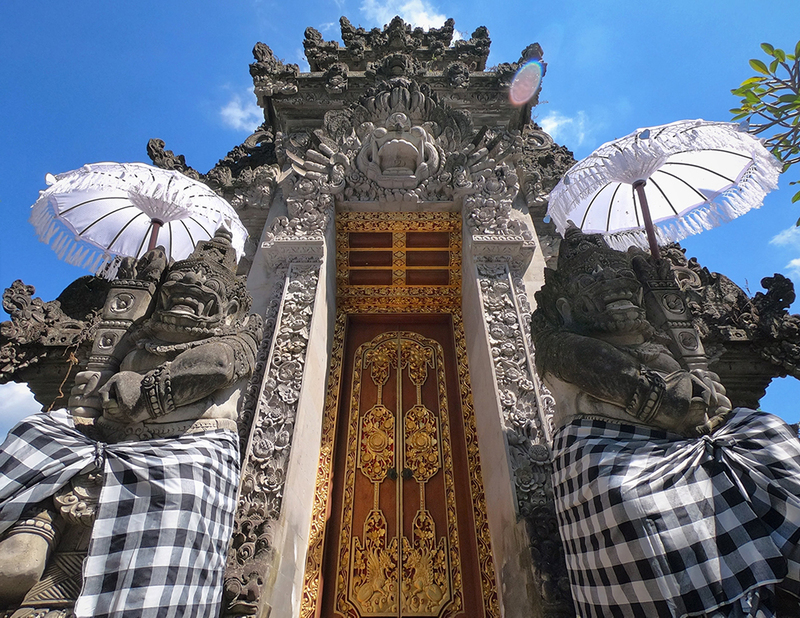 Read the image captions to discover Bali the way we did and learn more about this beautiful place in the heart of Indonesia. My favorite temple photo! 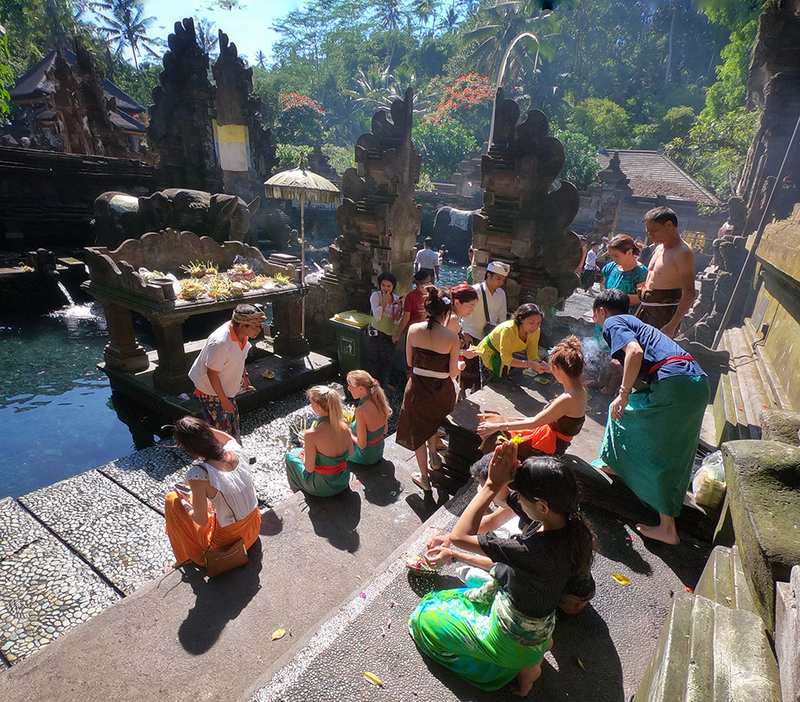 Pura Tirta Empul is a holy place for buddhists and we were lucky enough to experience this wonderful Hindu Balinese water temple in the quiet morning atomosphere before the tourists rushed in. 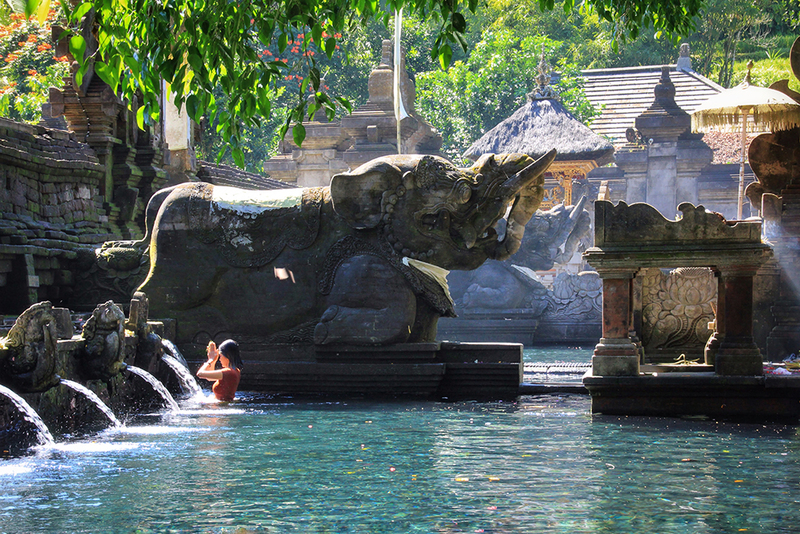 …of Pura Tirta Empul in Bali. 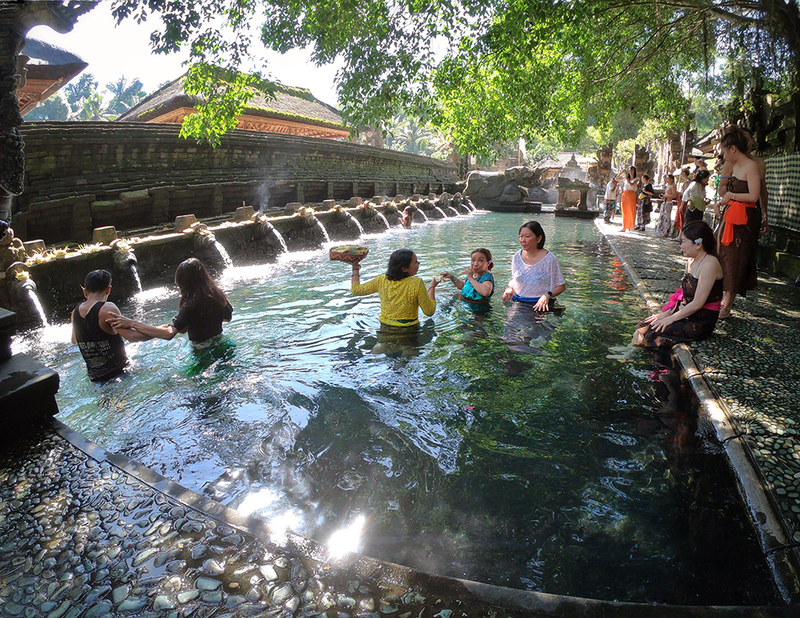 Judging from the faces, gestures and screams, even holy water is cold. 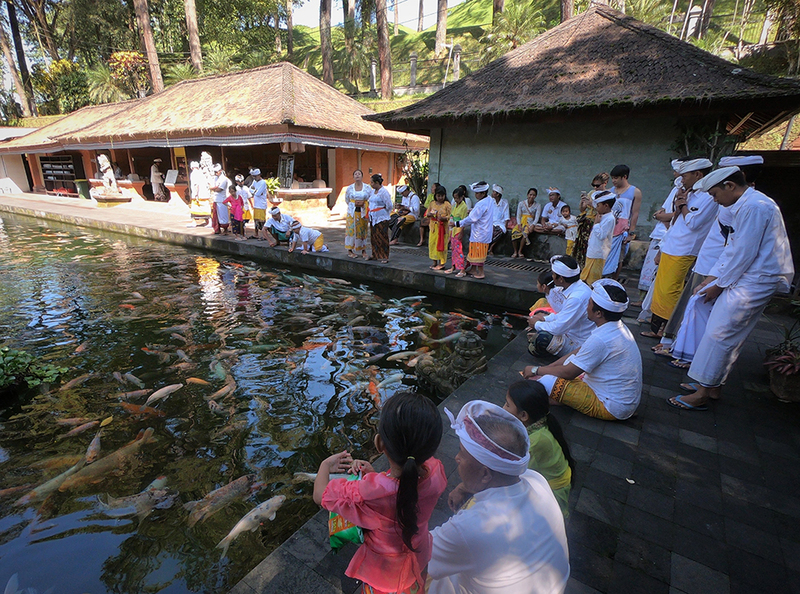 Most temples in Bali come with ponds full of koi, which symbolize good fortune, success, prosperity, longevity, courage, ambition and perseverance. 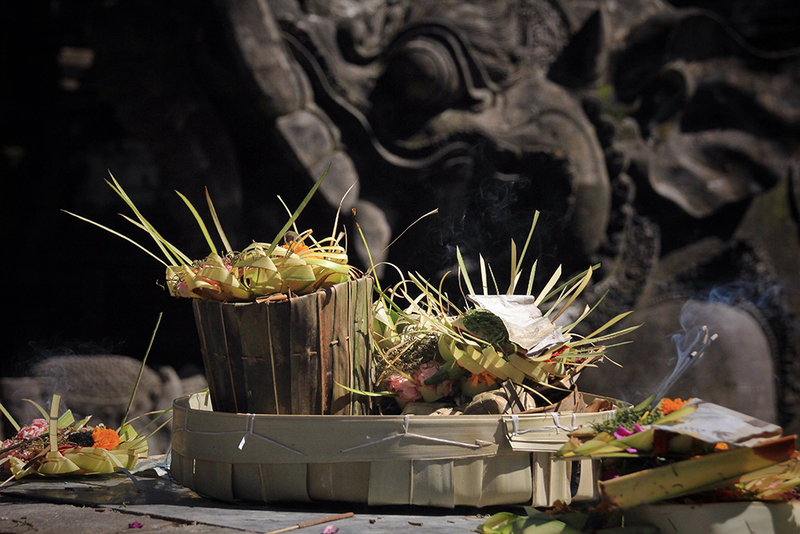 We were surprised by some of the daily offerings made by Balinese Hindus, especially the ones including real bills. 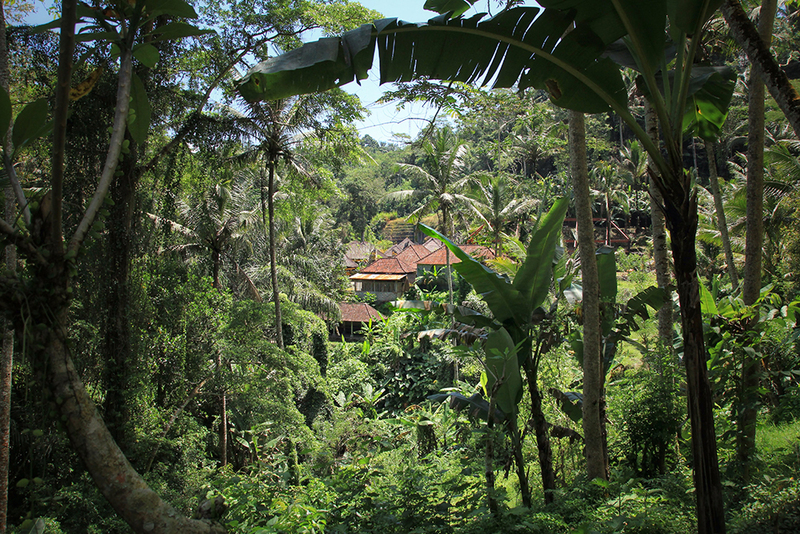 Welcome to the jungle, welcome to Bali! 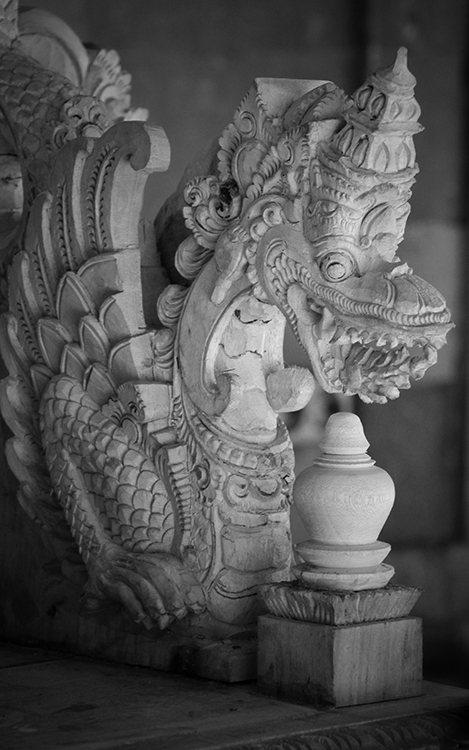 Loved those amazing details in Balinese stone art. 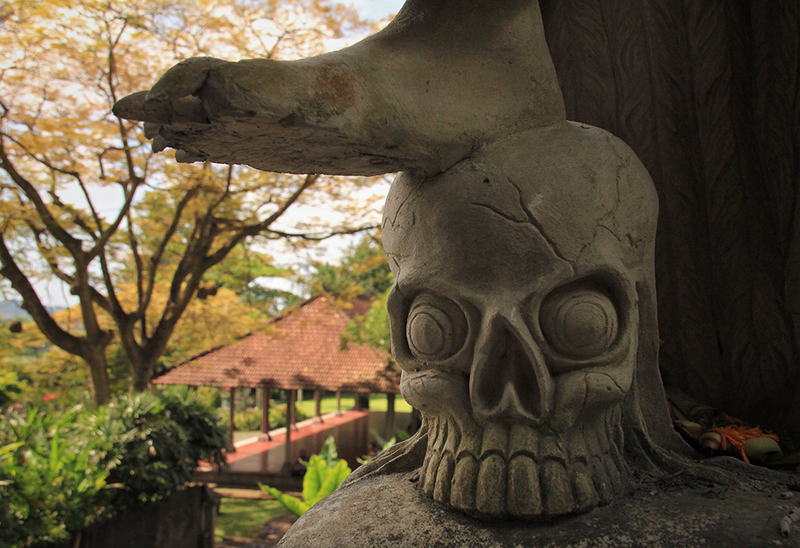 Another example, from a Balinese temple in Ubud. 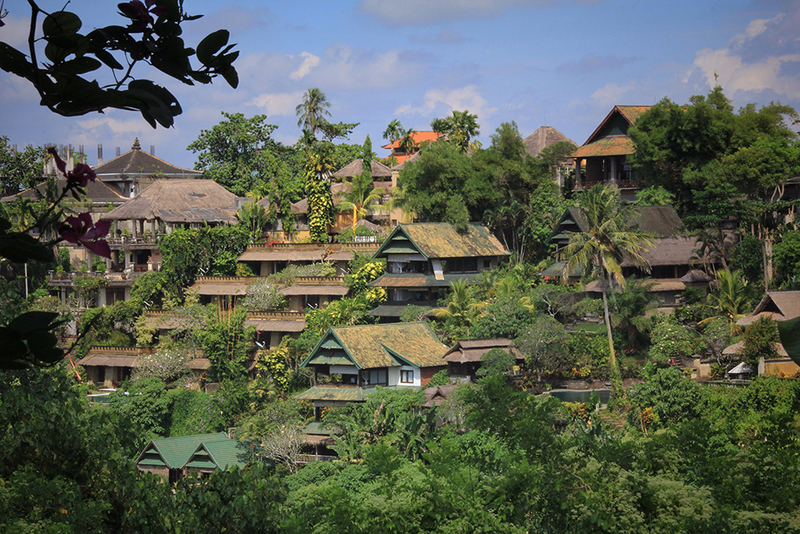 View over the rooftops of the Ubud outskirts as seen during the Campuhan Ridge Walk. 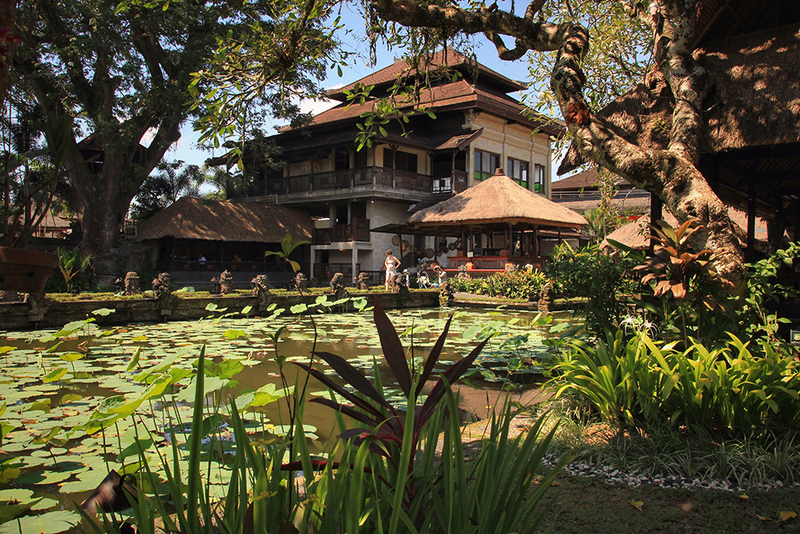 Just strolling down the streets of Ubud and stumbling across the Water Palace. 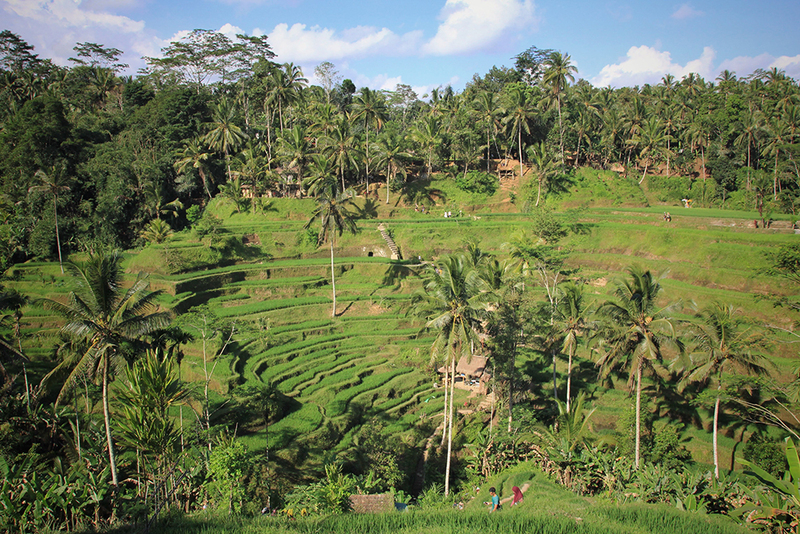 The beautiful rice terraces of Tegalalang. 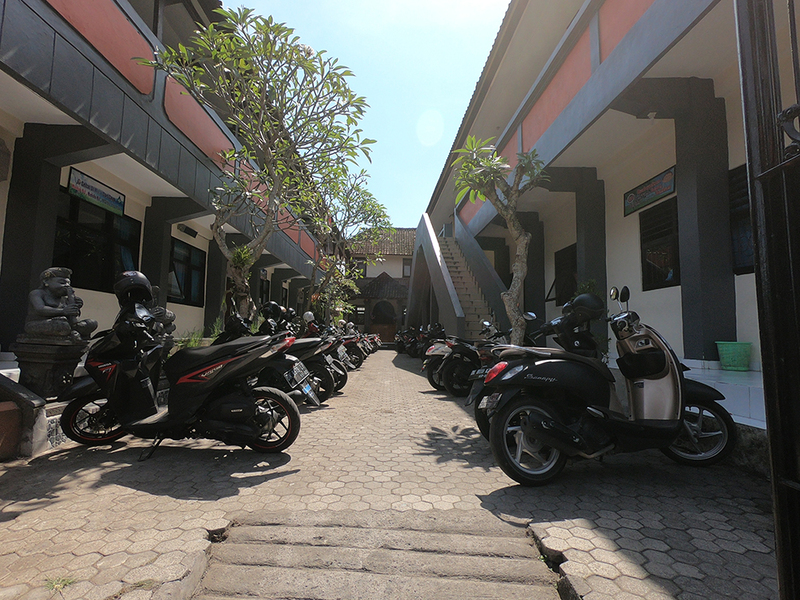 Bali is a scooter country. That’s how the kids go to school here! 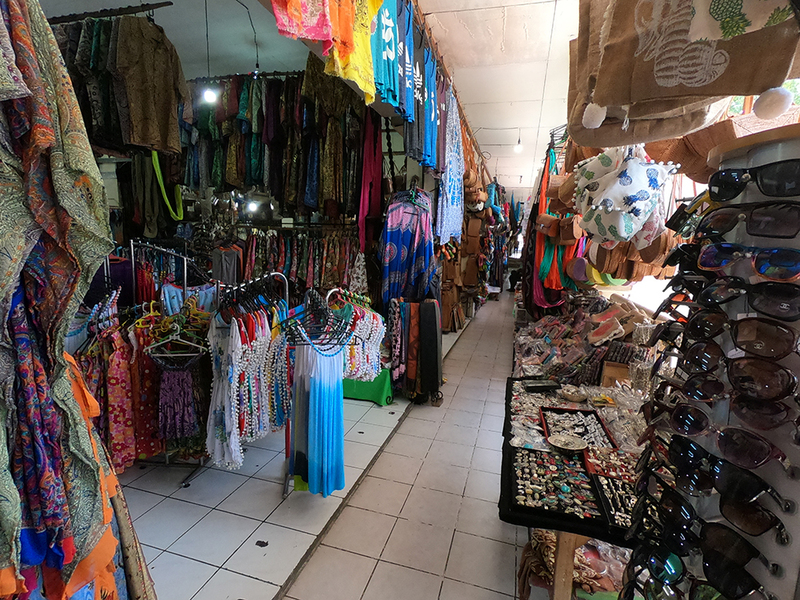 …full of souvenirs and kitch. 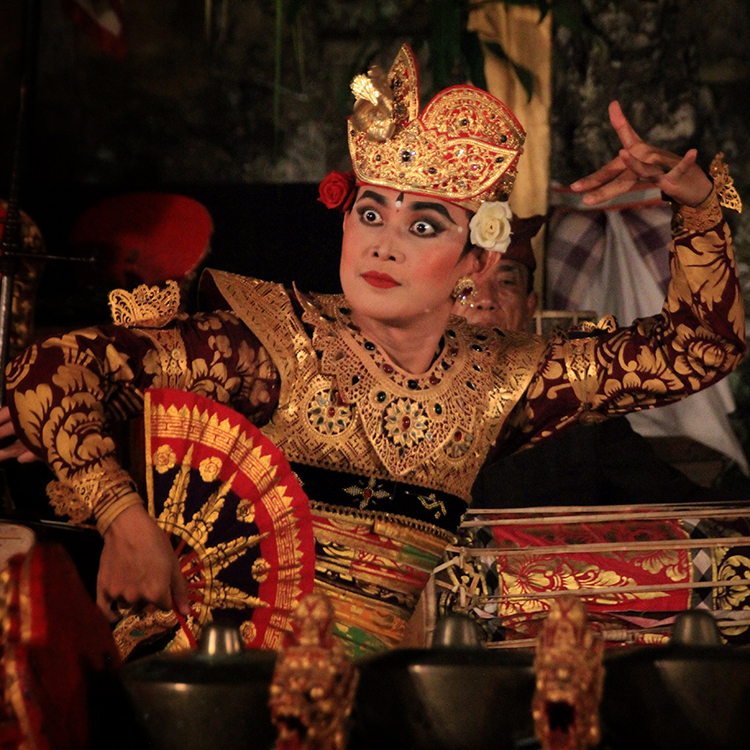 The landlord of our Ubud accomodation recommended us a very nice Balinese dance show at the Peliatan Royal Palace in Ubud. Look at this costume; the headdress and ornaments are fantastic! 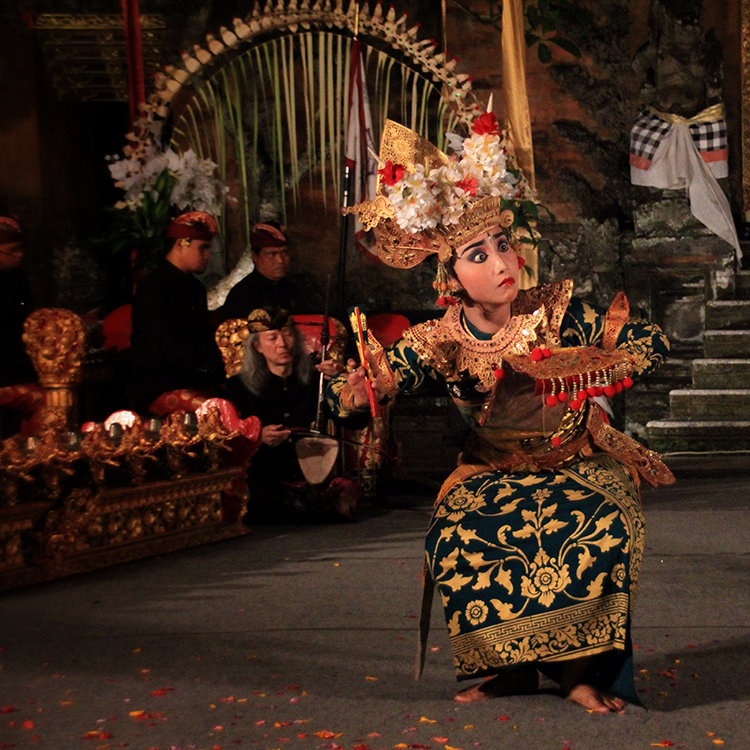 Visiting a traditional dance show in Bali is a must for travellers. We loved how they dance with their faces, even the eyes move in the rhythm of the music. 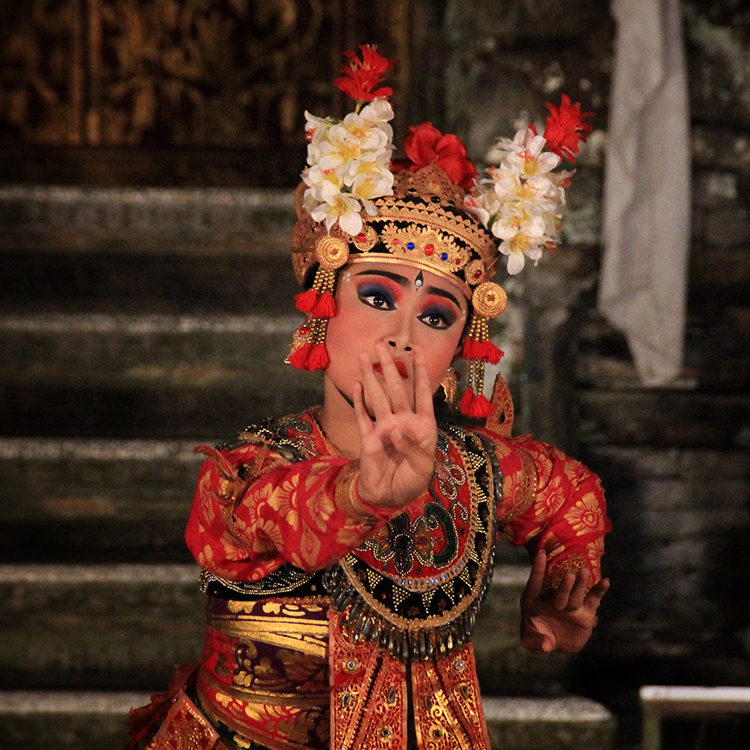 Hand positions and gestures, the mudras, are also extremely important for Balinese dancers. 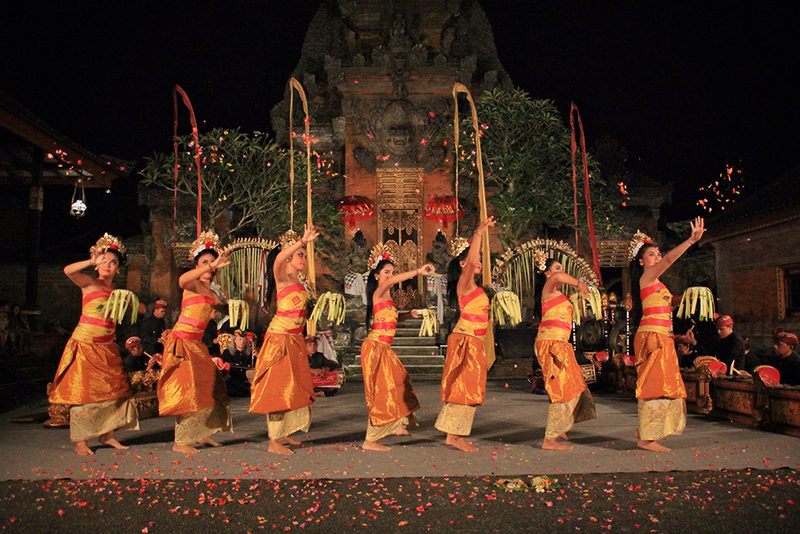 To see these dancers in action and listen to some Balinese music, please have a look at my video further down below in this blog post. 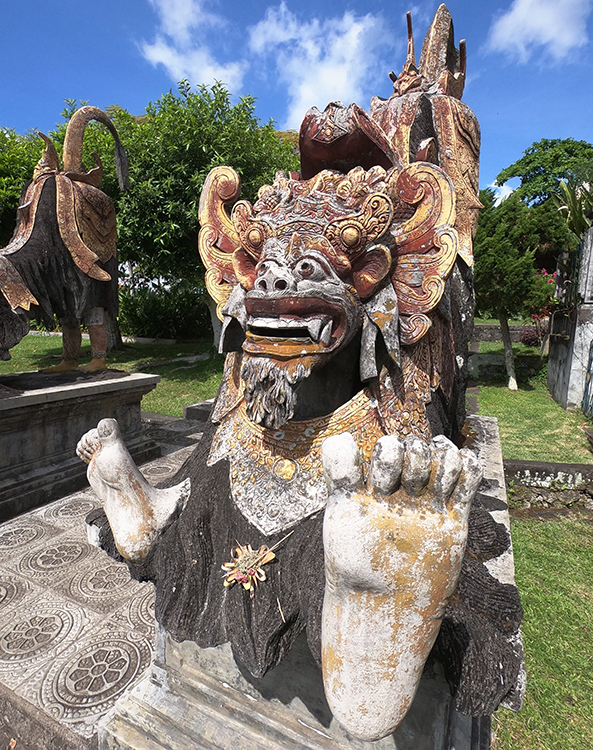 The king of the spirits, a lion-like creature, is a popular character in the Balinese mythology and can be found in most dance shows as well as various temples and palaces. 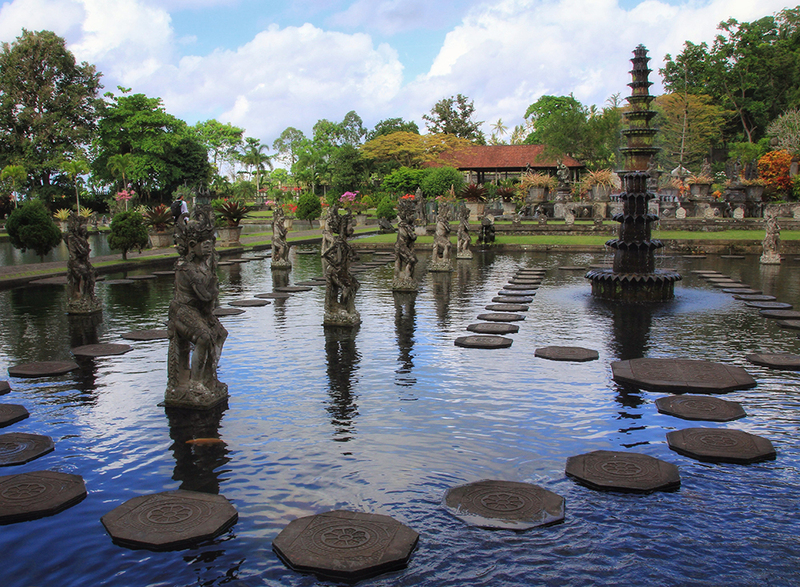 Tirta Gangga Water Palace was a great location to discover more characters from the Balinese mythology. 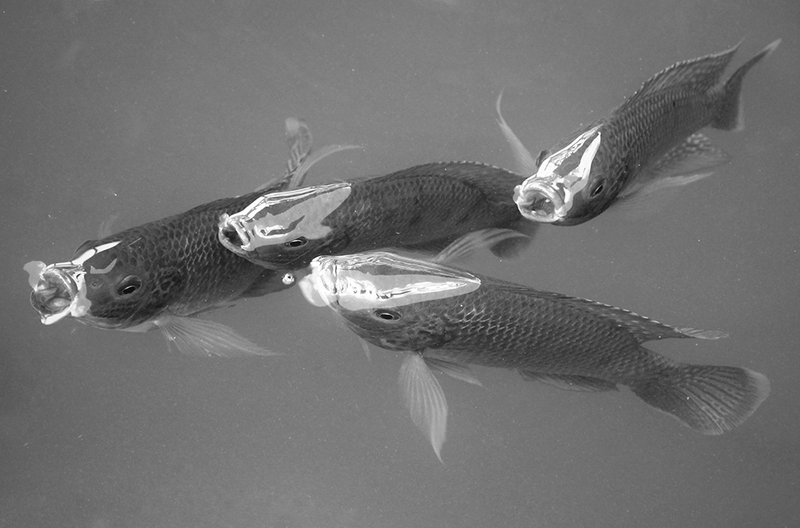 …the Koi pond invites you to walk over water. My daughter and I loved it here! 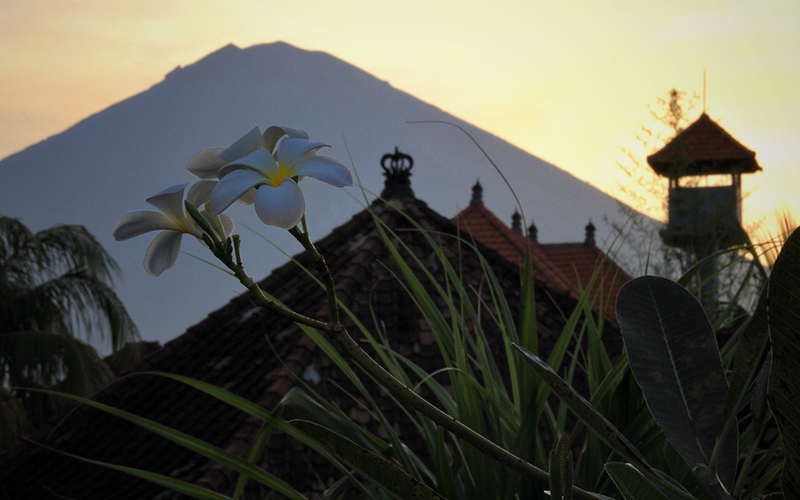 Is there anything more Balinese than Mount Agung, a temple and frangipani in one photo? Amed was our location of choice to explore the waters around the island. We had a couple of snorkeling days. 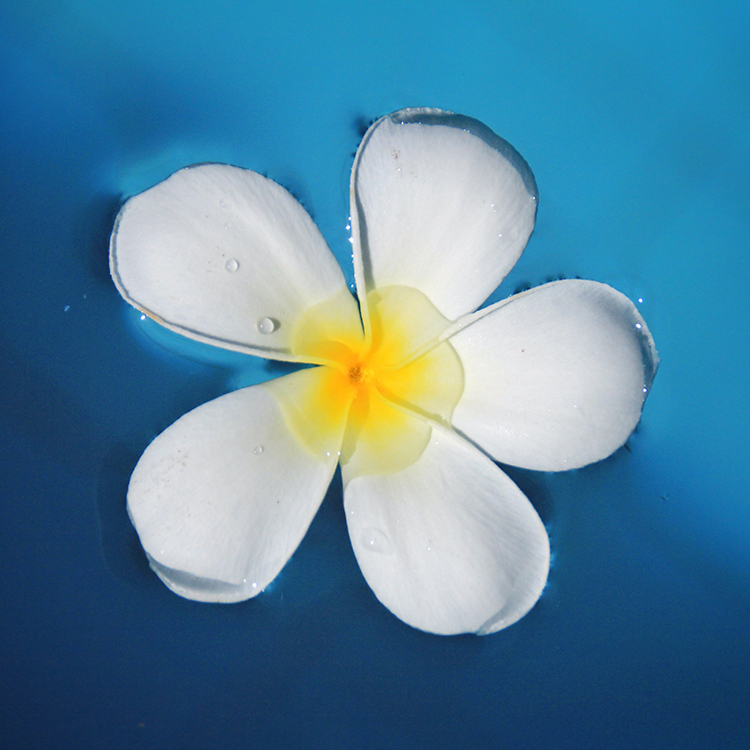 Check out the video below to get an idea of the underwater landscape near Amed. 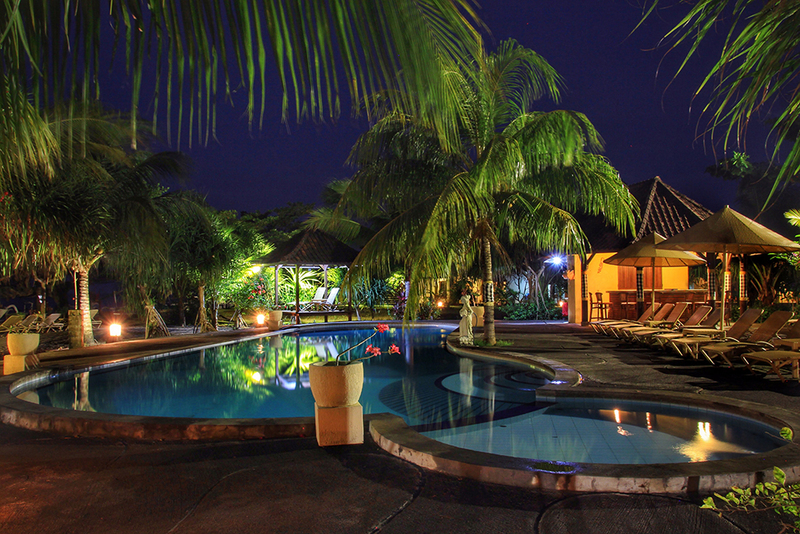 Travelling Bali end of April has been fantastic, just like our eco friendly Hotel Uyah Amed. We had this gorgeous pool side almost always to ourselves during 5 days. Don’t you want to swim in such a pool too? 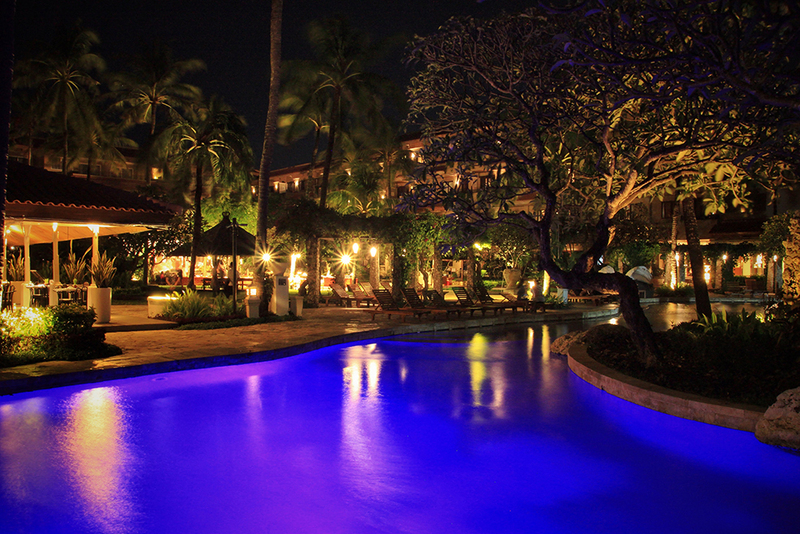 That’s the waterfall in the pool of Hotel Nikko Bali in Benoa Beach. 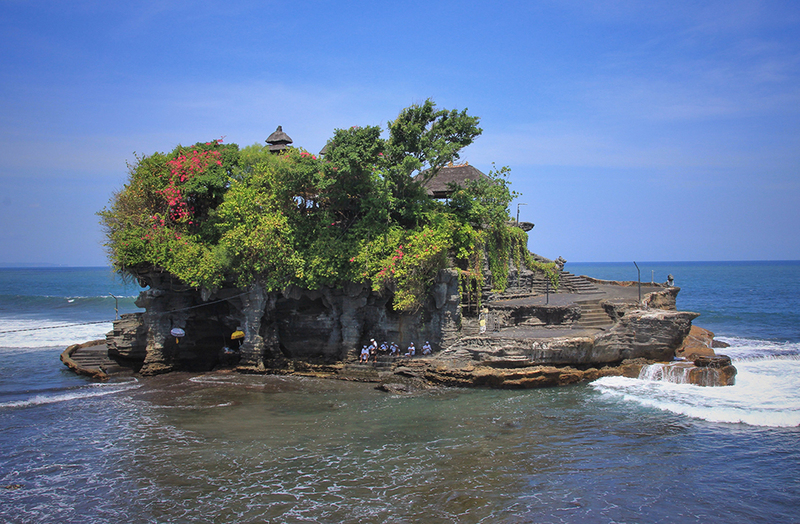 Tanah Lot was an interesting place to see; not so much for the rock formation, which is home to the pilgrimage temple, but because of the crazy amount of tourists showing up there to get a blessing during low tide (when you can actually walk to the temple). 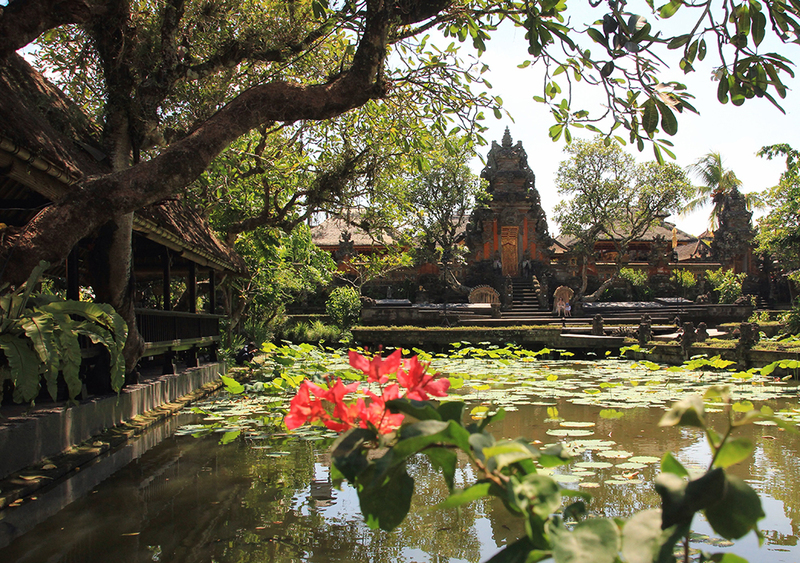 I have seen nicer temples in Bali (especially since this one is mainly hidden by trees), which means I wouldn’t really recommend going there when it’s not on your way. We arrived here after a 2.5 hours trip in a taxi, passing lots of traffic jams, just to stare at hundreds of tourists. If that is not your thing, go visit another temple. 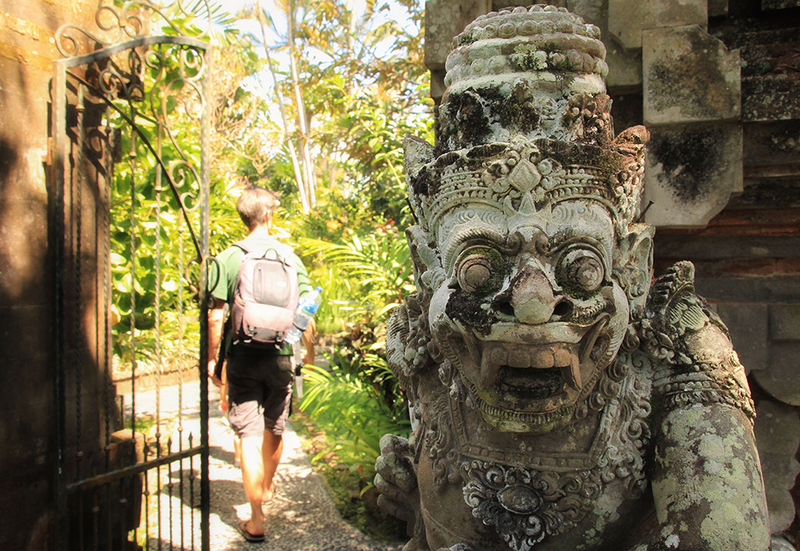 Bali is the country of a thousand temples, so you should find one you like. 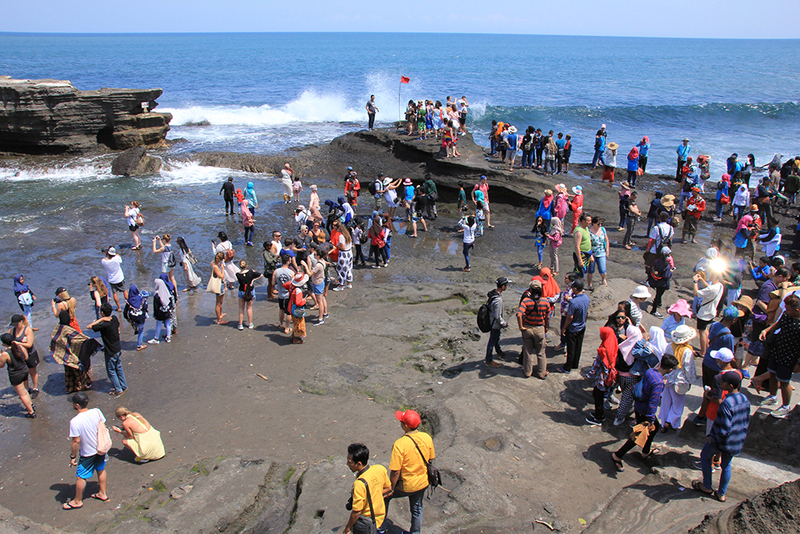 Tourist crowd at Tanah Lot. 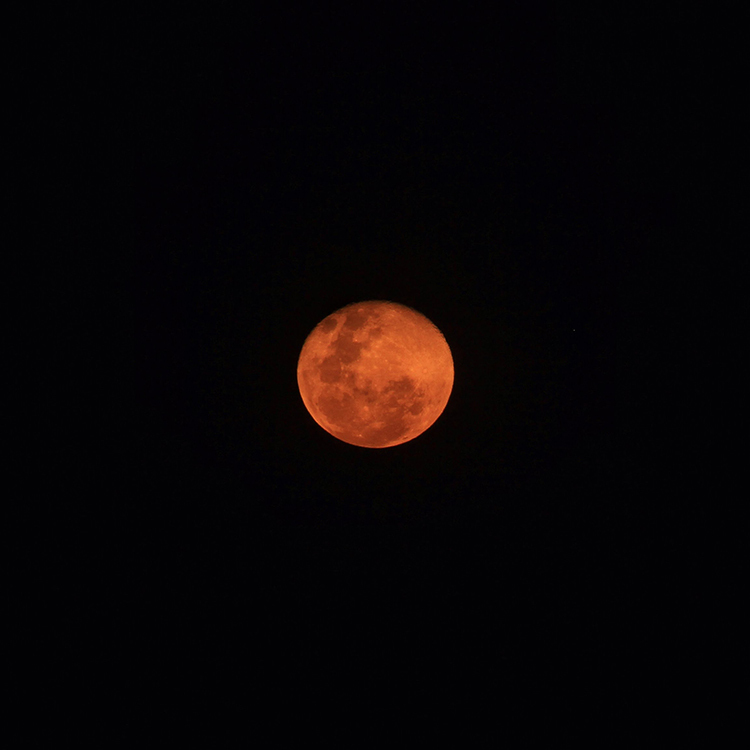 Lucky enough to witness a blood moon in Bali (May 1, 2018). Can’t get enough? Here are two bonus videos I created. 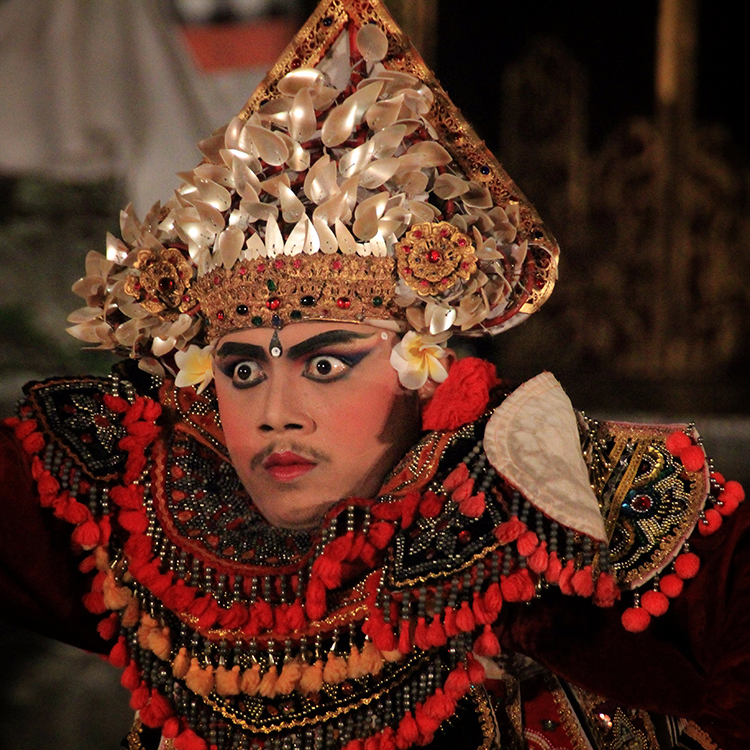 Enjoy a compilation of various Balinese dancers that appeared on stage at the Peliatan Royal Palace in Ubud on the 21st of April 2018. Get a feeling how snorkeling in Amed can look like. …not lost, just wandering! Digital nomad since 2011. Proud mum since 2015. Sharing impressions from the road. Enjoying Cappuccino, Binge Watching, Running, Social Media, GoPro & Canon’s EOS 60D. Fav place to be: lil ol’ EnZed.